Left to right: Professors Dimitri Hazzikostas, Clare Romano, Richards Ruben. The Pratt community mourns the loss of former Fine Arts professor Clare Romano, who passed away on January 25, 2017 at the age of 94. Romano, an artist and printmaker, taught printmaking to generations of Pratt students over several decades. She joined Pratt as a part-time faculty member in the fall of 1964, became full-time in 1973, and was named Visiting Distinguished Professor Emerita after retiring in 1991. Romano was a Pratt in Venice faculty member from 1988–2007. It was she, together with John Ross, who developed the printmaking aspect in the Venice program. Romano also held other teaching positions at the Art Center of Northern New Jersey and the New School in New York City. She co-authored books including The Complete Printmaker (written with her husband—the artist John Ross—and their sonTim Ross). Together Romano and Ross were pioneers in developing the collagraph. Her work has been shown in many solo exhibitions, and is represented in the Metropolitan Museum of Art and many other collections. John Ross (1921-2017) taught painting and printmaking at Manhattanville College and joined Pratt in Venice working with Romano in the Scuola di Grafica and thus providing the Program with a pair of master printmakers for ten summers. The couple met at Cooper Union and were together for 70 years. Ross served during WWII as a cartographer for the Army Air Corps. His artists' books and prints belong to major collections, including the British Library and the Hirschhorn Museum, and many more. In addition to solo shows Romano and Ross exhibited in duo shows. Romano and Ross are survived by two sons, Christopher Ross, a neurologist at Johns Hopkins and Tim Ross, an artist on the faculty of Manhattanville College. The work of both Romano and Ross is represented by The Old Print Shop in New York City. 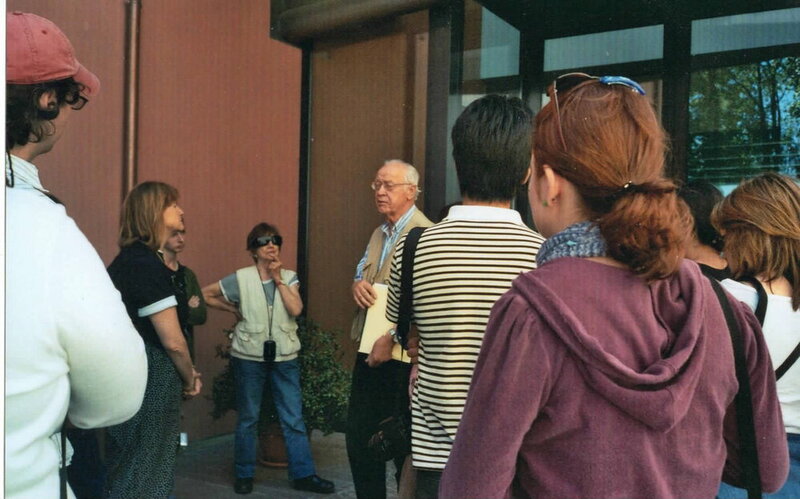 Below: Clare and John with students at the Tipoteca during the 2004 Pratt in Venice Program.